Trois frères et soeurs trouvent une créature mi garçon - mi chauve-souris, 'Bat Boy' dans une caverne dans la rupestre West Virginia. Le shérif local apporte alors le 'Bat Boy' chez le vétérinaire local, Dr. Parker. Il est vite accepté dans le famille Parker et éduqué la femme du Dr. Parker, Shelley, et sa fille, Meredith. Les choses sont compliquées lorsque Meredith tombe amoureuse de 'Bat Boy' et Shelley avoue qu'elle est la mère de ce même 'Bat Boy'. Furieux, le Dr. Parker pousse le peuple de la ville à s'enflammer dans une fureur meurtrière contre 'Bat Boy'. The Weekly World News 1992 story about Bat Boy, a half-boy, half-bat found living in a cave inspired writers Keythe Farley and Brian Flemming to write a stage adaptation. They were joined by American composer/lyricist Laurence O'Keefe and their first production premiered on Halloween, 1997. The later London production introduced significant changes to the script and score, including the replacement of the song 'In Your Heart' with 'Mine, All Mine'. 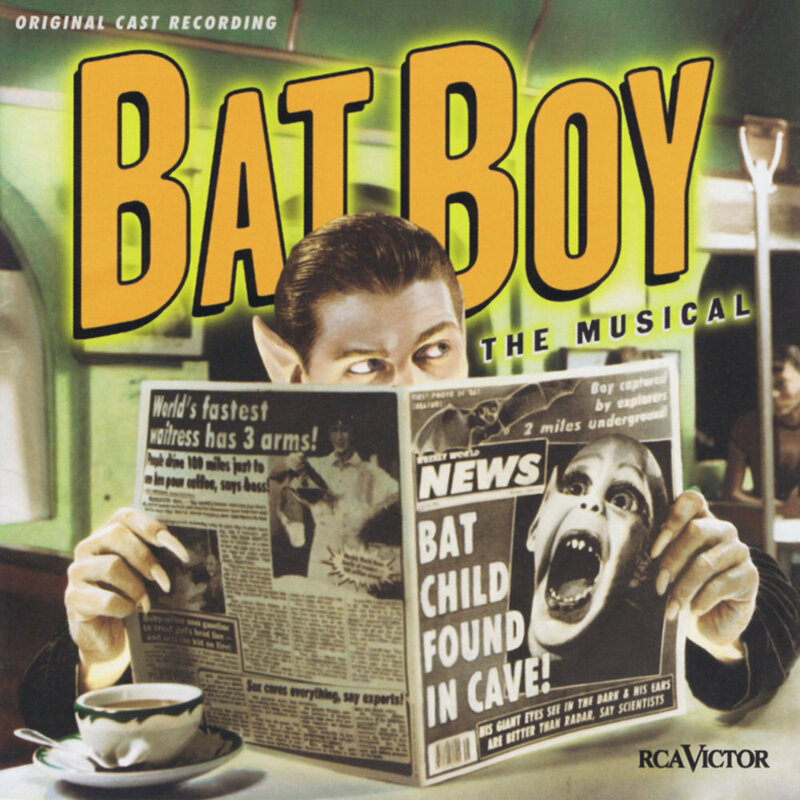 The musical differs in a few of its plot details from the Weekly World News portrayal of Bat Boy. 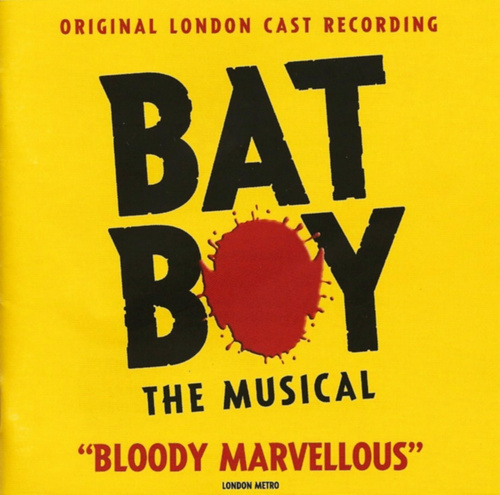 In the musical, Bat Boy learns to speak from his adoptive family, yearns for acceptance and tries to join society, only to face hatred and violence from a town that fears him and jealous rage from his foster father. The book deals with serious themes (such as hypocrisy, acceptance, forgiveness, racism, revenge and scapegoating), but often punctures the most serious moments with slapstick, surreallism, camp-horror and irony. The show also contains religious themes with biblical allusions, such as the quoting of Psalm 23 and Genesis 9:4 in scene 9. Act II begins with a religious revival tent meeting featuring a faith healer. The score was written to be played by a five-piece band of guitar, two keyboards, bass and drums, but the original cast album (RCA Records) contains seven extra instruments (cello, flute, clarinet, oboe, french horn, trumpet, trombone). The music covers many styles, from rock to rap to horror-movie film score and opera. The musical was written to be performed by a cast of 10, with six men and four women playing all the roles. Bat Boy: The Musical was developed at the Directors Company and premiered at Tim Robbins' Actors Gang Theatre on October 31, 1997. Directed by Keythe Farley, and choreography by Derick LaSalla. The cast featured Deven May as Bat Boy and Kaitlin Hopkins as Meredith Parker. The musical opened off-Broadway at the Union Square Theatre on March 21, 2001 and closed on December 2, 2001. Directed by Scott Schwartz, with choreography by Christopher Gattelli, the cast featured Deven May as Bat Boy and Kaitlin Hopkins as Meredith, Sean McCourt as Dr. Thomas Parker, Kerry Butler as Shelley Parker, Kathy Brier as Maggie/Ron Taylor, Daria Hardeman as Ruthie Taylor/Ned, Trent Armand Kendall as Rev. Hightower/Mrs. Taylor/Roy/Institute Man, Jim Price as Bud/Daisy/Pan, Richard Pruitt as Sheriff, Doug Storm as Rick Taylor/Lorraine. The swings and understudies included John Treacy Egan, Stephanie Kurtzuba, and J.P. Potter. The show was musically directed/keyboards by Alex Lacamoire, keyboards/assistant musical director Jason Debord, acoustic/ electric guitars Greg Skaff, electric bass Matt Rubano, drums Ed Fast. For the original cast album, the band was augmented by cello (Jeanne LeBlanc), french horn (Jeff Lang), flute/clarinet/oboe (C. Anderson), trumpet (Robert Millikan), and trombone (James E. Pugh). The musical opened in the West End at the Shaftesbury Theatre on September 8, 2004 and ran through January 15, 2005. It again starred Deven May as Bat Boy, along with Rebecca Vere as Meredith, Johnny Barr as Dr. Parker and Emma Williams as Shelley. It had previously played at the West Yorkshire Playhouse. It entered regional theatre in 2002 beginning with the Phoenix Theatre in Indianapolis. 12. May I Have This Dance? 25. Is All That You Taught Me a Lie? * Appear on the Original Cast Recording. Note that "More Blood/Kill the Bat Boy!" is included on the Original London Cast Recording. Also, for the London West End production and cast recording, "Inside Your Heart" is replaced with the song "Mine, All Mine", and "Ugly Boy"/"Whatcha Wanna Do?" are replaced by a song called "Hey Freak". Additionally, this recording begins with the end portion of dialogue before (and segues into) "Hold Me, Bat Boy". It is underscored by a portion of the song "The Cave". The track is titled "Dude! What is It?". Bat Boy - Also referred to as "Edgar." A bat boy. Meredith Parker - Wife to Thomas. Thomas Parker - Also referred to as "Doctor Parker." The town veterinarian. Husband to Meredith. Shelley Parker - The rebellious daughter of Thomas and Meredith. Girlfriend of Rick. Falls in love with Edgar. Sheriff Reynolds - The local sheriff, coming up for re-election. Sometimes doubles as Delia. Rick Taylor - A rowdy, spelunking teenager. Kin to Ron and Ruthie, son of Mrs. Taylor. Boyfriend of Shelley. Commonly doubles as Lorraine and Mr. Dillon. Ron Taylor - A rowdy, spelunking teenager. Kin to Rick, and Ruthie, son of Mrs. Taylor. Usually a drag role. Commonly doubles as Maggie. Ruthie Taylor - A rowdy, spelunking teenager. Youngest of three. Kin to Rick and Ron, daughter of Mrs. Taylor. Commonly doubles as Ned. Mrs. Taylor - An overprotective, aggressive mother. Mother of Rick, Ron, and Ruthie. Usually a drag role. Commonly doubles as Reverend Hightower and Roy. Lorraine - A townswoman. Usually a drag role. Commonly doubles as Rick and Mr. Dillon. Delia - A townswoman. Usually a drag role. Sometimes doubles as Sheriff. Maggie - The mayor of Hope Falls. Commonly doubles as Ron. Daisy - A townswoman. Usually a drag role. Commonly doubles as Bud and Pan. Mr. Dillon - A rancher. Sometimes doubles as Lorraine and Rick. Bud - A rancher. Commonly doubles as Pan and Daisy. Ned - A rancher. Usually a drag role. Commonly doubles as Ruthie. Roy - A townsman. Often doubles as Mrs. Taylor and Rev. Hightower. Clem - A townsman. Usually a drag role. Often doubles as Ron and Maggie. Reverend Billy Hightower - A preacher and faith healer who holds a travelling Tent Revival/Barbecue. Commonly doubles as Mrs. Taylor and Roy. Pan - The Greek satyr-god of nature. Commonly doubles as Bud and Daisy. A Doctor - Commonly doubles as Bud, Daisy and Pan. Institute Man - Commonly doubles as Mrs. Taylor, Roy and Rev. Hightower. Aucun dossier informatif complémentaire concernant Bat Boy. Bat Boy: The Musical won the awards for best Off-Broadway musical including the Lucille Lortel Award, two Richard Rodgers Awards from the American Academy of Arts and Letters, and the Outer Critics Circle Award in 2001. Regional productions of Bat Boy have been nominated for and won awards including the 2003 Elliot Norton Award (New England). and the 1998 Ovation Awards (Los Angeles). The off-Broadway production received very positive reviews. The New York Times review stated, "It's remarkable what [this show's] intelligent wit can accomplish". John Lahr of The New Yorker called it "a giggling cult hit" and "the only play in the history of the theatre whose hero ends Act I with a rabbit in his mouth, and who moves on in Act II to an entire cow's head." Curtain-Up praised : "Laurence O'Keefe's peppy and melodic pop-rock score... played by a five piece combo". The West End reviews were less positive. The Curtain Up review notes: "...unless Bat Boy The Musical gathers a cult audience, I fear it will not linger. The newspaper critics do sometimes get it wrong, ...but they have been less kind to Bat Boy than the West Virginians portrayed in the musical." The subsequent sell-out 2006 Edinburgh Festival production of the revised score used in the West End received very positive reviews, with many suggesting the show suited this more 'scaled-down' style. Avec : Cast: Deven May (Bat Boy), Rebecca Vere (Meredith Parker), John Barr (Dr Parker), Emma Williams (Shelley Parker), Andrew Bolton (Sheriff), Gareth Richards, Julie Jupp, Robyn Isaac, Maurey Richards, David Beckford. La version londonnienne a été revue pour qu'elle soit plus internationale (des références directes à certains points de la culture américaine n'auraient pu être comprises aisément). Il s'agit de la version définitive du spectacle, c'est du moins ce que les auteurs ont déclaré. Notes: Inspired by a story in the weird and wonderful “Weekly World News” in June 1992, which claimed a “Bat Boy” half-boy, half-bat, had been found living in a cave, the musical opened off-Broadway in March 2001 for an 8 month run. The script and score were heavily revised for the UK production which was first staged at the West Yorkshire Playhouse. The book deals with serious themes (such as hypocrisy, acceptance, forgiveness, racism, revenge and scape-goating), but all too often punctures any underlying serious satire with slapstick, surrealism, camp-horror and irony. With only one or two exceptions, it was hated by the critics. “This asinine, pretentious and self-admiring musical is one of the most repulsive shows I’ve ever seen” (Sunday Times). There was some praise for Deven May, the American performer who re-created his off-Broadway performance in the UK. It ran just four months.